Engineers Without Borders (EWB) conducted a workshop on November 30th 2008 on how to convert "Waste (mostly agricultural)" in to "Fuel" which can be used instead of exhausting the non renewable resources. 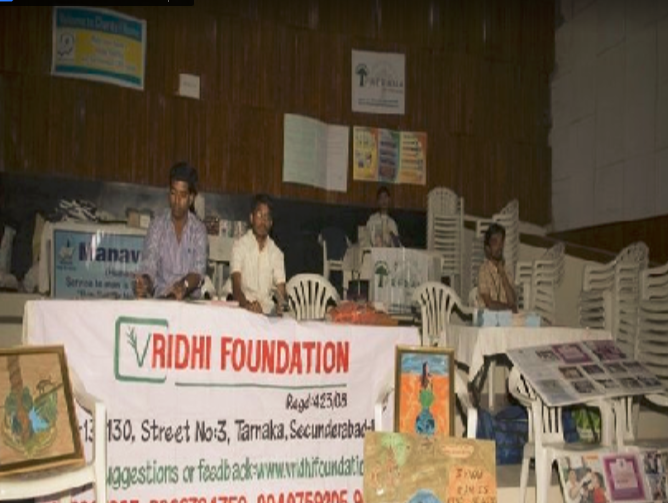 Vridhi Foundation attended the workshop to get more knowledge on how the method of converting waste in to fuel could be used by rural population. The method was called "Fuel Briquette Making Technology" and the intention was that it reaches people in remote areas supporting their families by selling the biomass briquettes and instead of depending on conventional fuels. The workshop was also conducted to find a solution to the problem of cooking fuel in rural areas where there is abundant agricultural waste and many households do not have cooking gas. Above all it will create the awareness in the society to conserve energy and move towards a better future. 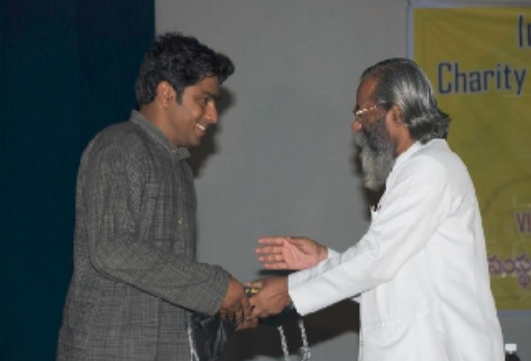 Manavata, a not for profit organisation had conducted International Charity together Conference at Tagore Auditorium, Osmania university,Hyderabad on 4th Jan 2009. It was organised to create a platform for bringing together different social groups and NGOs and act as a support group to each other. The event had several NGOs participating and each one shared their vision and explained their field of work. Vridhi was also given an opportunity to set up a stall to educate participants and volunteers on climate awareness issues. 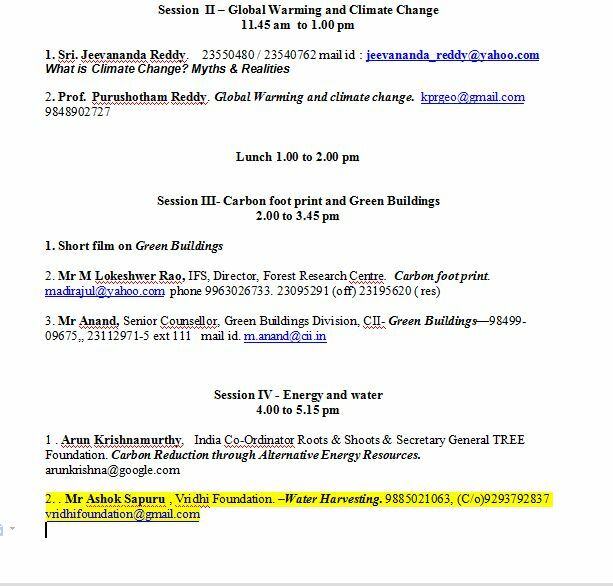 Recycled informative brouchures were distributed as well as volunteers registered themselves to participate in our future activities.Aditya Koppula represented Vridhi on the dais and put forward an informative speech on the climate issues impacting all and ways to mitigate its effects. On February 21st and 22nd,2009, Mr Dave Kutz and Ms Mona Yeh (Students from United States of America volunteered for an organization called Modern Story) had approached Vridhi Foundation for plantation and climate change awareness programme at Government High School located Vijaynagar Colony in Masab Tank. 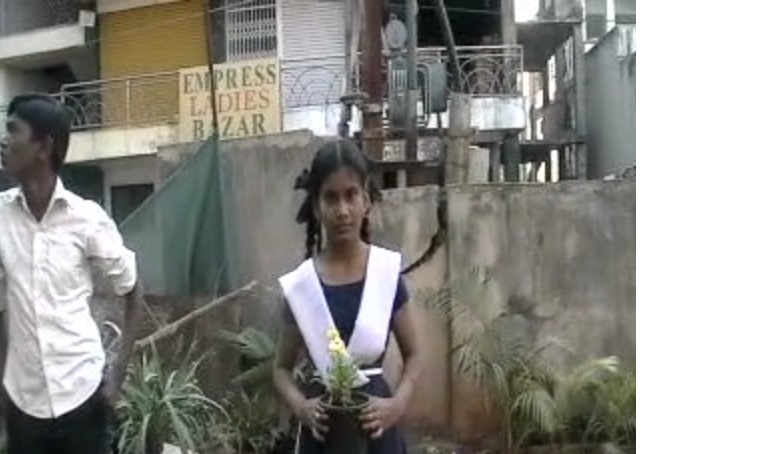 Students raised funds from the local neighborhood for the plantation programme by selling vegetable and flower seeds. The funds raised were spent on the associated costs of the plantation like labour and transport while Vridhi Organised plantations from the local nursery. Teachers and Students participated in planting 30 saplings and they have been given necessary guidance on how to look after them. At the end of the project , students and teachers were highly motivated and were constantly in touch with Vridhi Foundation to get involved in activities. We invited them to participate in Water Hyderabad Campaign which was after a month and most of the students and teachers turned for the campaign and made this successful. This is a classic example that if the young minds are nurtured and taught the importance of environment, the day is not far away that we don't have to live with the fear of the after effects of climate change anymore. 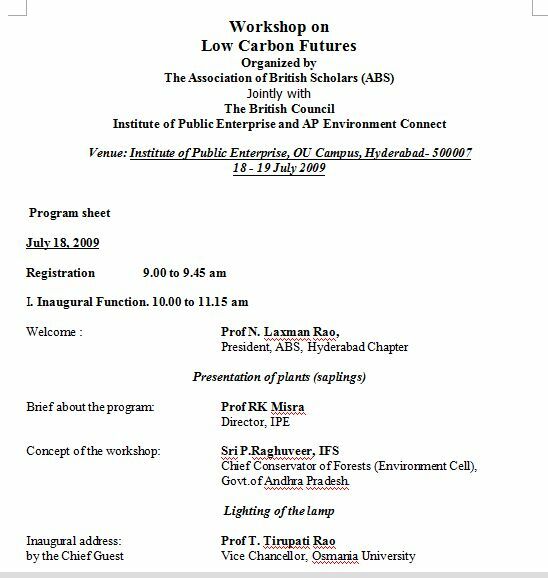 On 18th July 2009, The Association Of British Scholars, Hyderabad Chapter organised a two day workshop on Low Carbon Futures at IPE, Osmania University and we were invited to be a part of the workshop. The seminar had some eminent guest which included IFS officers, Amala Akkineni from Blue Cross, CII representatives and IPE faculties. The workshop had several eminent speakers and it was an informative session. On 19th July, we had an opportunity to put forward our thoughts over water conservation and we did a presentation on Rain water harvesting. The presentation was given by Ashok Sapuru and was well received as it included the then water level situation, information over types of rain water harvesting, advantages of having rain water harvesting structures, the various designs, success stories, and importance of having a Rain water center like some other states Tamil Nadu, Gujarat, Uttar Pradesh, West Bengal and Kerala benefitting the people by becoming a center for awareness. A suggestion of having our own rain water center in Hyderabad was also suggested as a measure of bringing awareness among people. Indian Youth Climate Network was established in 2008 as a coalition of youth and youth oriented organizations to knowledge enable Indian youth over climate change and encourage county wide bonding for action over climate related issues and environment. With politicians around the world meeting at Copenhagen,Denmark from December 11th-18th to work on a global climate policy for the reduction of global CO2 emissions, Danish embassy was supporting the organization of base camps during the Copenhagen summit to follow the proceedings. Apart from Delhi and Chennai, Hyderabad was chosen to be one of the major base camps in India. A base camp is a live coverage of the COP15 through internet. IYCN organized the camp at Indoor Auditorium, Taramari - Baradari. [A.P. Tourism Development Corporation], Ibrahim bagh, Hyderabad and along with the live coverage, it also included conferences, debates and film screenings. It was attended by environmentalists, NGOs, scientists and youth who wanted to make a difference. Kashyap and Vishwanath attended the conference representing Vridhi Foundation. They had the opportunity to interact with numerous participants but also had the chance to participate in the debate and present our views towards climate change. It was a platform where some of the great minds were present and we had the pleasure to gain more knowledge towards the climate change issues and ways to fix it. Andhra Pradesh was lashed by torrential rains in October,2010 and it was the worst flooding in that region in the last 100 years. October was an unusual month to have floods as we begin to enter winter in India. Scientists say we will see more of this kind of thing as climate change speeds up. Flood waters has ravaged parts of Andhra Pradesh as a result of incessant rain in Andhra Pradesh. These floods had affected millions of people making them homeless and crippled their lives. The affected regions lacked clean drinking water and food. The situation in the flood affected areas had become worse as communication and power had broken down completely and large parts of the flood affected areas were not reachable by road.We were in touch with the government officials and village officers to find out the list of villages that were badly affected.Many individuals and institutions had taken the onus to help the government in their rehabilitation of the victims and to bring them to their normal course of life. Sahasra and Vridhi Foundation pooled in the resources and asked for donations to get basic supplies for the affected victims of the flood. We thank the donors and volunteers who came forward to help the affected. The village that was chosen after our research, for extending our support and help the victims was Ektapur in Mahboobnagar district of Andhra pradesh( now Telangana). We went to the village on 17th October 2010 and managed to get utensils, clothes, general food supplies and books for children from the funds that was raised. The flood was an eye opener for a lot of people as it acted as an example of the changing climate and its implications. To witness the floods was a horrific experience for the victims and we certainly don't want a repeat of it for our future generations. We must act now to prevent any natural disasters which could be avoided. We all know time stops for none and each passing second brings new prospects as well as changes in ones' life and surroundings. It may not be unknown to you of what we propose to you below but knowing it and doing it differs a lot. With the change in climate being felt by us, we thought it would be best for us to take small but effective steps towards curbing down the reasons for climate change. 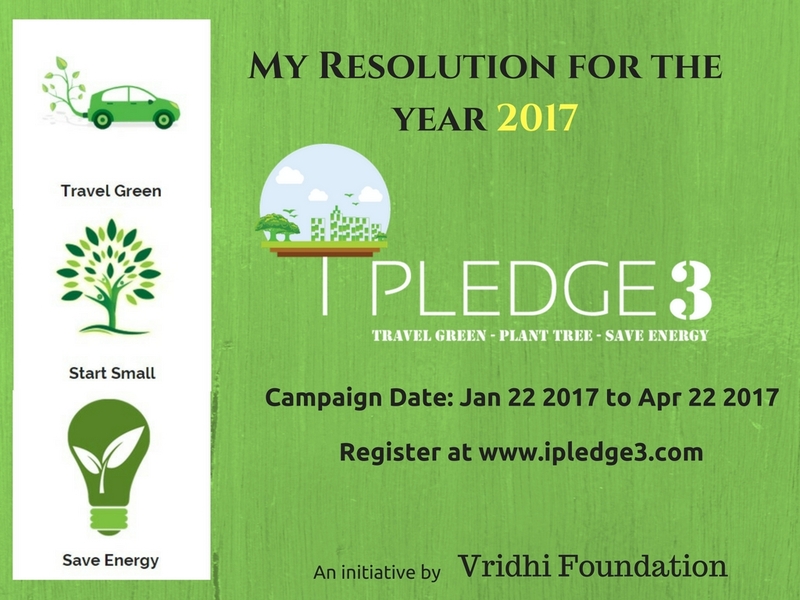 We are driving a campaign called "I PLEDGE 3" which requires you to do a little things which will make a big difference for you and your future generations. The motive of I PLEDGE 3 is for you to make it a habit of doing the below things instead of just doing it for the three months. The 3 things that we suggest are things which won't need a lot of your time from your schedule but rather with few tweaks and changes we can get an output desired for a better planet. 1) Travel Green - 1/3 of the world's gas emissions are because of vehicles, therefore, I Pledge to ditch my car/motor bike and do a car pool or share a ride or take the public transport as much as possible. 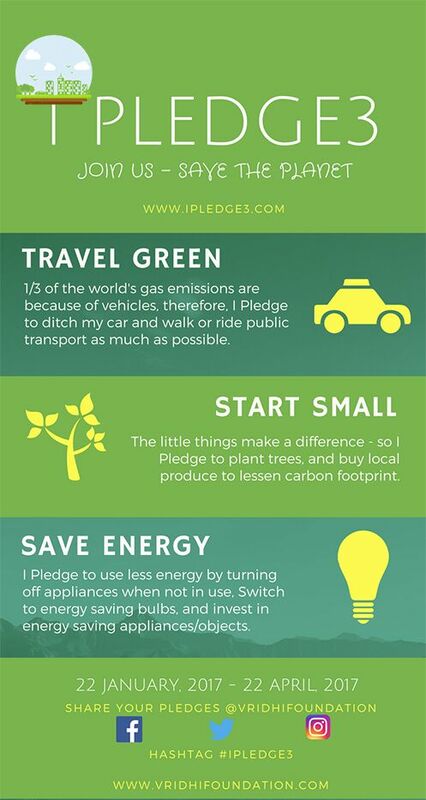 2) Start small - The little things make a big difference- I Pledge to plant trees and buy local produce to help lessen the carbon footprint. 3) Save Energy - Use less energy by turning off appliances when not in use- I Pledge to switch off the appliances when not in use and will switch to energy saving bulbs and invest in energy saving appliances. Besides the three things advised above, you can also do things which you believe can make a difference in curbing the reasons for climate change. The campaign starts on January 22nd and ends on April 22nd 2017. 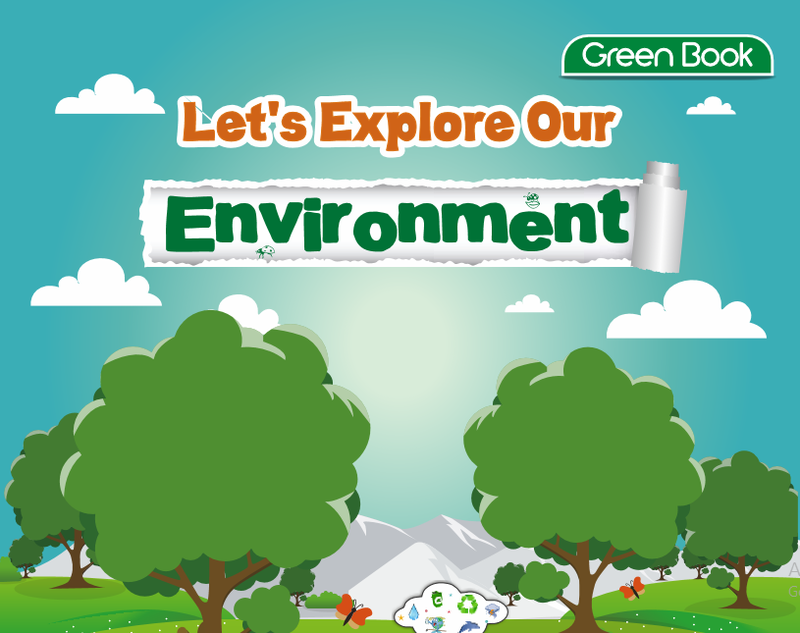 The aim of this 3 month campaign is to create awareness and encourage people to embrace a sustainable lifestyle combating climate change. It is an online campaign designed in a way where each individual can make a small but significant contribution towards mitigating the effects of climate change. Each participant will be able to share their contributions online via social networking platforms (Twitter, Facebook, Instagram and LinkedIn) and through word of mouth. You can register for the campaign at www.ipledge3.com and can upload your pictures using “#ipledge3” in Instagram, Twitter, Facebook or LinkendIn and motivate others to join the movement. Thank you and please adhere to the pledge you take.